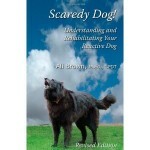 SUMMARY: Treatment protocol for the easily frightened dog, or phobic dogs. For the layman. AUDIENCE: It sits uncomfortably between two types of audiences: too basic for the professional, and too in-depth for the dog owner. I guess the niche is the very dedicated dog owner, and for them, it very clearly breaks down the therapy protocol for reactive dogs, and the beginning professional. REVIEW: The books somewhat lacked structure, and covered some subjects at surprising depth, considering the title and target audience (layman). But do you know what? Thankfully so! Because Ali Brown’s account of dog nutrition, de-sensitisation and counter-conditioning, are simply the best explanations I’d ever read on the subject. She clearly masters the subjects, and has a way with vivid images and clear explanations. I thoroughly enjoyed reading it. Her background in teaching clearly shows throughout the book, as she has a real talent for making abstract concepts tangible and clear. I have even borrowed her wording to explain some concepts to non-professionals. I suspect the book is self-published, or at least on a limited budget, so the presentation and design weren’t all that. But it really didn’t bother me. I thoroughly enjoyed reading that book and will look out for more by Ali Brown. Browse the Book Review archive. Genre: professional manual. Author: Brown Ali. Reading Level: Professional. Star: 4. Bookmark the permalink. Post a comment or leave a trackback: Trackback URL.